Family is the basic unit of society. It’s a truism that’s accentuated even further on holidays with the tribe in tow. CW recently discovered a value-for-money family-oriented on-roader, and as its moniker indicates, it’s purpose-built for family exploration. 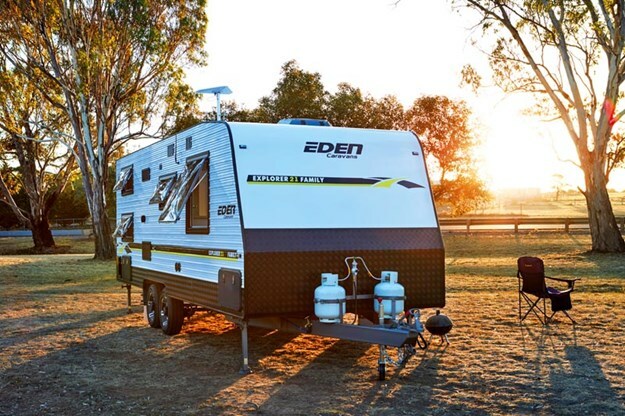 Yes, the Eden Explorer 21 Family caters perfectly for the whole clan — especially the ‘kiddiewinks’. 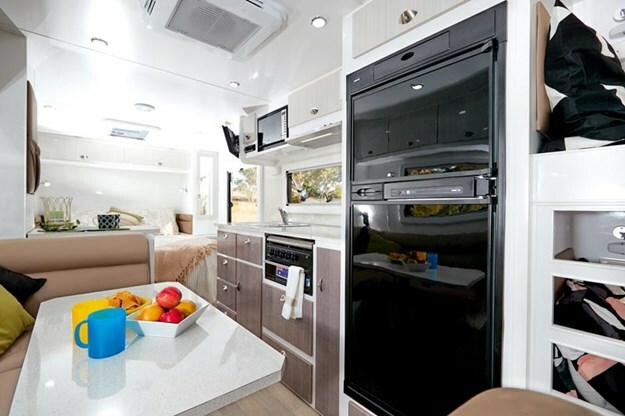 This classy, well-built double-bunk van — manufactured not surprisingly by Eden Caravans, a close-knit family business based in Campbellfield, Vic — promotes family togetherness. 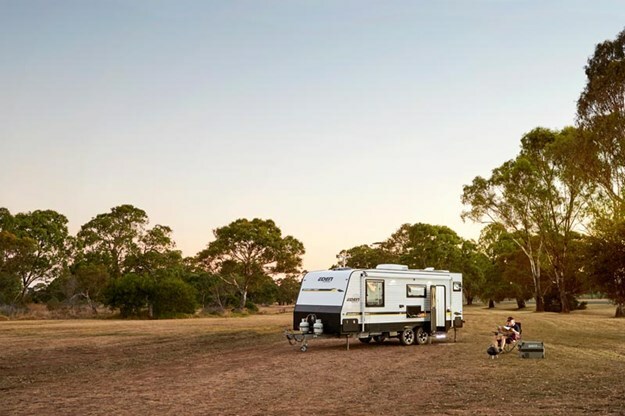 Proprietor Paul Nedanis and his three sons — Damien, 28, Josh, 24, Adam, 20 — have hit a sweet spot with the Explorer, which will impress any modern family intent on a caravanning lifestyle. Obviously the ultra-comfortable double-bunk configuration, which takes up the rear section of the offside wall, is an internal highlight that will put a rose in the cheeks of the little ones. 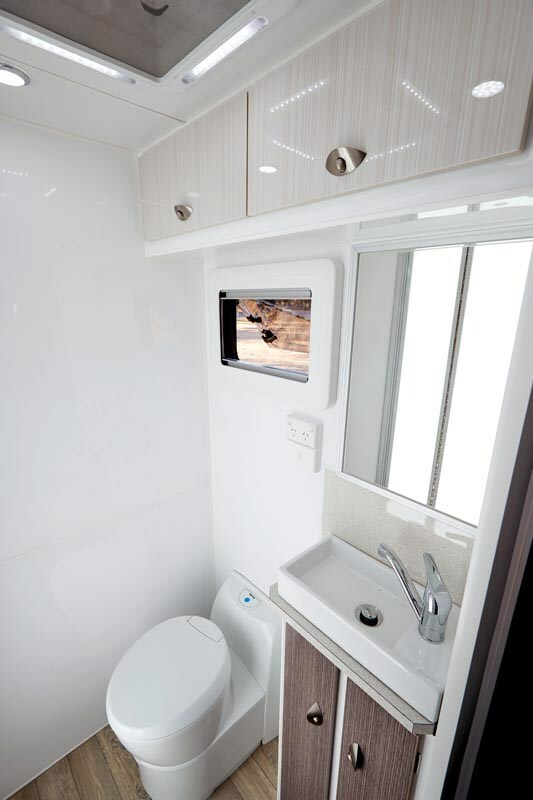 Both generously sized bunks sport windows, reading lamps, double powerpoints and USB ports. There is also storage space under the bottom bunk, which can be accessed via a ‘fold-down door’. And a skylight at the front of the bunks lets the light shine in, along with additional ventilation. The parents’ front bedroom is also pragmatic, with a dash of panache. 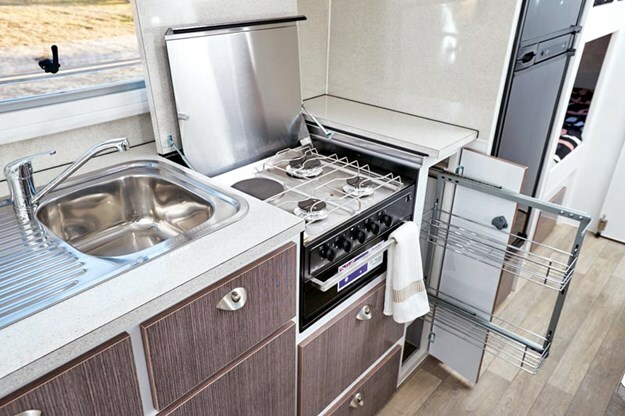 There’s also plenty of room to move around the caravan-queen-size bed (6ft 2in), with an innerspring mattress, padded bedhead and a gas-assisted lift. I also liked the panoramic double-glazed Dometic windows either side, which, complemented by a Ranger skylight, adds an airiness to this zone. And there’s no shortage of storage space — including two mirrored robes with good hanging height; two dressers, each possessing a slide-out drawer and cupboard; and liberal under-bed space. Two reading lights and a couple of double powerpoints are expected requisites. 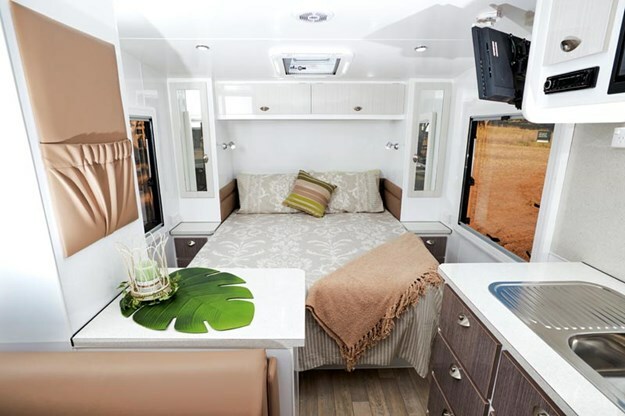 At the front of the bed on the offside wall sits a swivel bracket for the 24in TV, and facing the front of the bed on the nearside are a few cupboards and a couple of slide-out drawers complemented by shelving compartments. The well-appointed living zone, immediately left of entry on the nearside wall, features an inviting U-shaped lounge with high density cushion seating that will comfortably seat four people, a dining table, two reading lights, a double powerpoint and USB points, and a smallish window. At floor level are two fold-down storage compartments located at the side of the seating. A quartet of overhead cupboards ensures sufficient storage, albeit one houses the electrical suite comprising a Voltech battery charger, Voltech 40A battery protector, water heater switch, Coast to Coast water tanks monitor, and fuses. The workable kitchen, situated directly opposite the lounge room, boasts a Swift gas/electric mingrill, a stainless steel deep sink and flick mixer tap, full splashback, a built-in 20L NCE microwave above the sink (which I thought was set a little high), a 12V rangehood above the solid ply benchtop with two storage compartments above, a two-tier wire basket pull-out pantry below the benchtop, and abundant storage with all drawers on rollers. But what impressed me most about this galley is the ample bench space for meal preparation. Adjacent to the kitchen is a 184L Thetford three-way, two-door fridge with black infill, plus lift-up cupboard above. Meanwhile, occupying most of the rear wall is the ensuite with a bolt-locked sliding door for privacy. It’s not a bathroom of grandiose appearance and style, but it’s very practical. There’s a full-height, one-piece fibreglass shower on the left as you enter, with a ‘bifold door’ (open pivot) which saves space. A Thetford swivel toilet is located to the right of entry, along with a 12V hatch and LED strip lighting above. And completing the bathroom configuration is a washbasin and mirror set above two cupboards, while two cupboards and a window are located above the washbasin and toilet. The Explorer 21 Family’s climatic control is provided by a remote control Houghton Belair HB3200 air-conditioner, while in-house entertainment is via a DVD/CD/BT/MP4/MP3 player and ceiling speakers. Internally, the Explorer emits ample light and ventilation, and there are LED downlights in all the right places. And hot water is at the ready courtesy of a 22.6L Suburban gas/electric HWS. On the outside, the van simply radiates with its new Allytech (carbon fibre look) aluminium cladding, and I must say I’m a big wrap for the all-Alucobond panel at the rear. It’s not only aesthetically pleasing but adds structural solidity. And the roof and walls are well insulated. The nearside comprises requisites such as a triple lock entry and security door, full-width tunnel boot, roll-out awning, fold-down picnic table, manual pull-out single step and illuminated grab handle. There’s also a 100Ah deep-cycle battery fastened to a chassis rail. And an offside hatch offers convenient external access to the under-bunk storage space. The van’s front features high checkerplate with an Alucobond panel above, dual 9kg gas cylinders with twin regulator, external mains pressure tap, an AL-KO 50mm ball coupling, and a 4in A-frame. There’s also an easily accessible spare wheel mounted on a two-arm bumper bar at the rear. And the 4in SupaGal chassis with 4in riser provides excellent ground clearance. The Explorer also has sufficient solar (1x150W) and water (2x95L) capacities for a family happy to be largely confined to caravan parks for the duration of their journey. And this dual axle van will guarantee the family a smooth ride to its destination given capable roller rocker suspension, 15in alloy wheels with high profile tyres, and 10in electric brakes with Breaksafe. The Eden Explorer 21 Family certainly meets its ‘family first’ brief. And with a price tag just under $60K, it’s got oodles of appeal to the growing family with a bent for hitting the bitumen. In essence, it’s purpose-built for the modern family!